Independent Sen. Bernie Sanders, left, and Democratic Rep. Peter Welch, right, both won their re-election bids in the 2018 election. Both spoke at the Democratic Party's event in Burlington on Tuesday night. Vermont's congressional delegation won't change next year. Sen. Bernie Sanders and U.S. Rep. Peter Welch both won re-election last night by wide margins. Not long after the polls closed, The Associated Press declared Sanders the winner in his U.S. Senate race. Sanders ended up getting about 67 percent of the vote as of late Tuesday night. Republican U.S. Senate candidate Lawrence Zupan delivers his concession speech at the DoubleTree Hotel on Election Night. 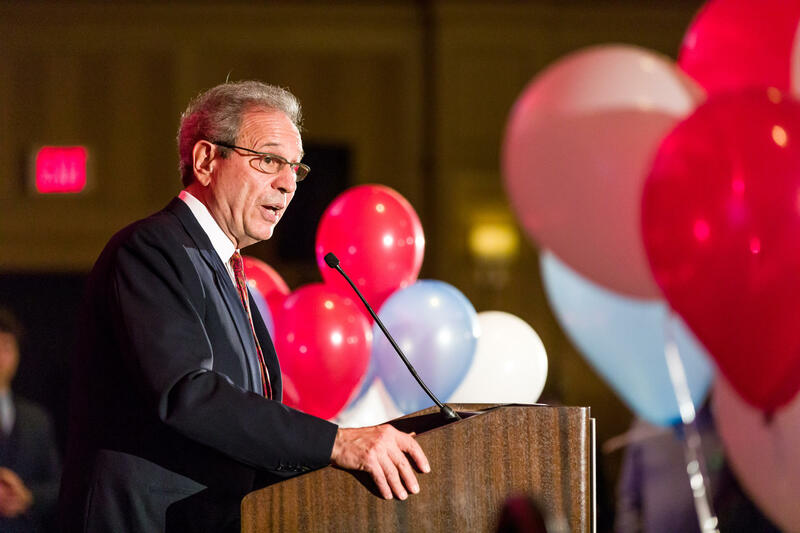 Republican Lawrence Zupan got the most votes of the eight candidates challenging Sanders — Zupan ended up with about 27 percent of the vote. Find national and statewide Vermont results here. Sanders said the midterm election was a pivotal moment in American history and framed the Democratic victories as a referendum on the Trump administration. "Our job is to tell this president that we will not tolerate policies which are racist and sexist and homophobic," Sanders said, as the crowd at the Vermont Democratic Party's Burlington event cheered. "That all over this country the American people, led by the state of Vermont, are going to stand up and fight back." Find Vermont House and Senate results here. Welch will also head back to Washington to represent Vermont. When he spoke last night, it was before the Democrats had taken the majority in the U.S. House of Representatives. 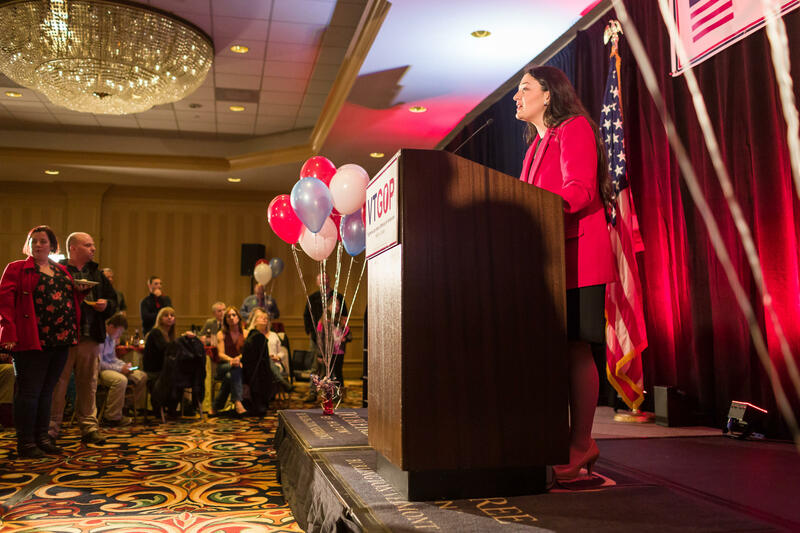 Republican U.S. House candidate Anya Tynio speaks at the DoubleTree Hotel, which is where the the Republican Party held their Election Night event. Tynio lost to Welch in her bid to represent Vermont in Congress. Welch said Democrats would continue to stand up to President Donald Trump, but he said the real challenge would be to get actual policies passed. "It is to do things that need to be done for working families, whether they are from Vermont or Oklahoma, whether they voted for Clinton or they voted for Trump," Welch said. "They deserve and need lower prescription drug prices. They deserve and they need affordable college education. They deserve and they need an opportunity for their kids to learn a trade so they can be independent." Welch won re-election with nearly 70 percent of the vote. Republican challenger Anya Tynio got around 26 percent. Incumbents vying to retain statewide office in Vermont had a solid showing in 2018 midterm election. Vermonters head to the polls to vote in the 2018 general election: this is your place to get full results for national and Vermont statewide races, via NPR and The Associated Press. Check back here at 7 p.m. for live updates as the polls close! Vermonters head to the polls to vote in the 2018 general election: this is your place to get Vermont House and Senate results, via The Associated Press. Check back here at 7 p.m. for live updates as the polls close!